Nigerian flutist Ogo-Oluwa Sobukola began studying the flute at age 16, and because of his extraordinary promise, was fully funded by the MTN Foundation in conjunction with the Musical Society of Nigeria (MUSON) a few years later. As a chamber and orchestral musician, Ogo-Oluwa participated in a tour to the 10th Stellenbosch International Chamber Music Festival in the same year. An outstanding student at the MUSON School of Music, he received the David Nwamara Prize for best graduating woodwind student in 2015 and was featured as a soloist at the Commonwealth Head of Government Meeting 2015 (CHOGM), held in Malta, where he performed with the commonwealth orchestra. He has performed various solo and chamber works spanning from baroque to modern repertoire and has attended masterclasses with flutist Demarre McGill and Diana Baroni. 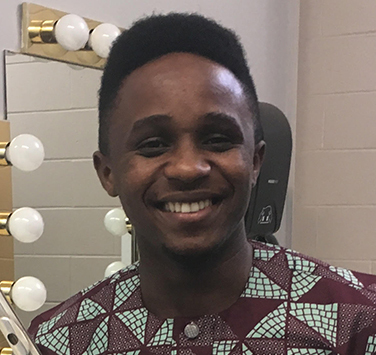 Since his arrival in Canada in September 2017, Ogo-Oluwa is enrolled in his second year of the BMUS program at Dalhousie University’s Fountain School of Performing Arts in Halifax, Nova Scotia. He studies with Patricia Creighton, principal flautist of Symphony Nova Scotia and flute instructor at the Fountain School. He has had several prestigious performances since arriving in Canada. Last February 2018, he was featured as a flute soloist with Symphony Nova Scotia for their Family Series’ concerts “Black Is Beautiful”, under conductor Daniel Bartholomew-Poyser. He subsequently performed again with Symphony Nova Scotia this past September 2018, for “Symphony Week and Culture Days”. He was also highlighted as a soloist last February, for Dalhousie FSPA University’s student orchestra “Concerto Night”, performing Mozart’s D+ Concerto’s 1st movement. He is currently principal flautist of the Nova Scotia Youth Orchestra. FACEBOOK: Ogo-Oluwa in Halifax.